TheVerge.com is a team of journalists that examines how technology will change life in the future. Vertepac XTR.35 in the Scottish Highlands. “Searching “backpack” on Amazon yields over 200,000 results, of which 199,998 are utter crap. Materials, pockets, and fasteners might differ, but they’re all iterations on the same theme. That’s why the backpacks from Vertepac are so compelling. Instead of making yet another boring bag, the Dutch startup is trying to solve a problem as old as humanity: how can we carry more stuff with less effort? And you know what? They’ve cracked it. But innovation ain’t cheap. Vertepac builds its bags around a carrying unit composed of a lightweight frame and an extendable spine attached to a hip belt. The carrying unit is designed to be modular, whereby it can be inserted quickly into any Vertepac bag. When worn, the backpack rests on your hips like a regular internal-frame pack designed for camping. Vertepac says 95 percent of the load rests on the hip belt, with the rest on the shoulders in order to keep the load under control. That sounds about right. The so-called Parallel Spine is the star though, lifting the bag ever so slightly off of your back, while twisting, lengthening, and contracting in tune with the movements of your body, just like your own spine. 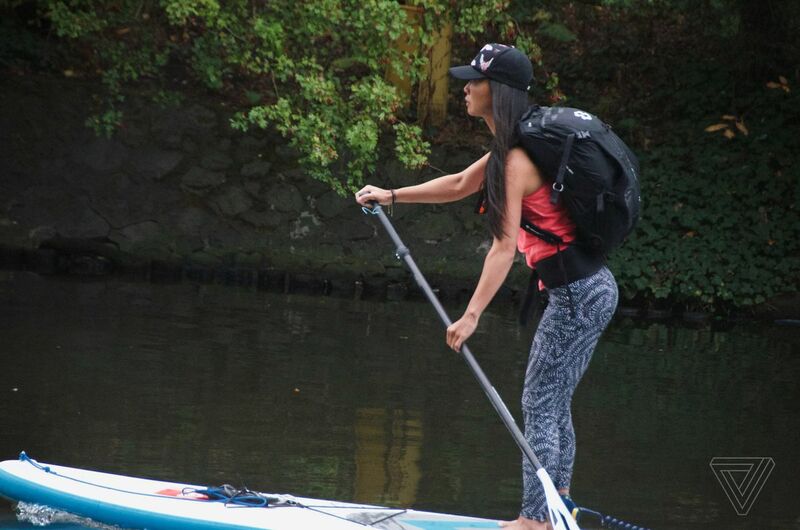 The hip belt never moves, and the bag remains relatively still, giving you a greater sense of stability and balance as you walk, climb, ride, or paddle. The improved weight distribution is felt as soon as you slip on the bag, with the three-pound (1.35 kg) weight of the carrying unit dissolving into your hips, not your shoulders. But it’s under heavier loads that the Vertepac’s carrying system really pays off. My wife and I have been testing both the 35-liter XTR.35 and 18-liter XTR.18 bags over the last month, logging hundreds of hours and miles with the backpacks. The XTR.18 bag (minus the three-pound frame) weighs just 1.36 pounds (620 grams), while the XTR.35 weighs just a tad more at 1.65 pounds (750 grams). We’ve worn the bags fully loaded while slogging through the Scottish Highlands and pastoral Dutch dunes, bicycling through the streets of Amsterdam, and stand-up paddleboarding along its canals. The bags allowed us to carry heavier loads for longer, with a far greater degree of upper body mobility. The Vertepac system requires a one-time setup whereby you extend the spine and lock it to match the belt with the top of your hips. 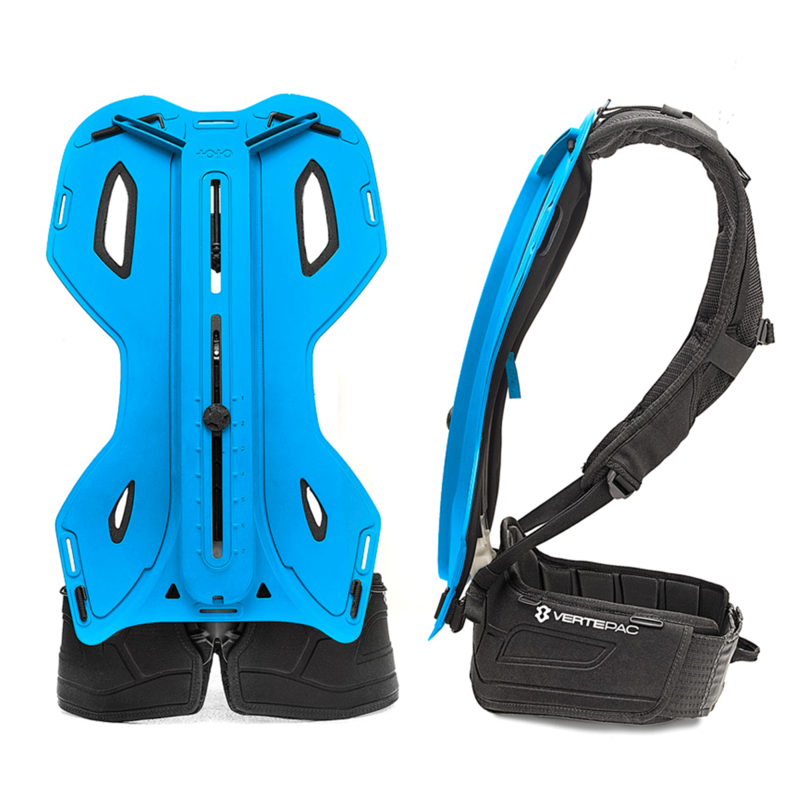 You then put the Vertepac on like any other backpack, but you have to extend the spine and close the hip belt and chest strap to feel the benefits. I had to readjust the spine after my first hike because it wasn’t sitting correctly. It was too high on my hips which caused the hip belt to tilt forward and dig into my back. The hip belt can be closed with either a traditional buckle closure or an elastic-velcro closure, the latter offering a bit more comfort, I found. The spine can be retracted with a tug of a strap, causing it to retract up the channel. Vertepac XTR.18 on the Amsterdam canals. 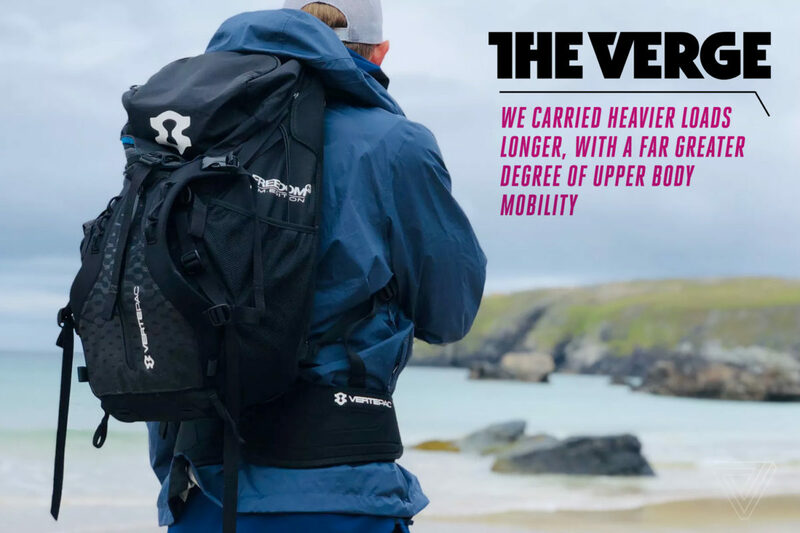 Let me be clear: the Vertepac XTR.35 and XTR.18 are not competing with high-end daypacks from the likes of Peak Design, Boundary, or Waterfield Design. There’s no padding or sleeve for your laptop, drone, or camera gear, and the few pockets available are too deep for fastidious organizers. I did regularly carry my DSLR, a few lenses, and my laptop, but they were in their own protective cases. Vertepac tells me that it’s actively working on a 42-liter camera bag with a hard cover for 2018, but they weren’t able to show me a prototype yet. The Vertepac XTR bags are designed for outdoor use with a giant main compartment for your gear, a multi-function helmet carry, and a few outer pockets protected by waterproof zippers. The bags also feature a bag liner (for easy cleaning) in the cavernous main compartment along with accommodations for your favorite hydration bladder and hose (my three-liter Streamer bags from Deuter fit both bags nicely). Otherwise, the XTR.35 and XTR.18 are fairly typical top loaders, made of durable, lightweight material with tons of lash points, handles, and dangly straps to cinch everything down. Not that I’m complaining. We’ve been regularly stuffing the bags to their breaking points, typically carrying loads between five and 15 kilos (11 to 33 pounds) without a single tear, broken zipper, or other such malfunction. The Vertepac system does have some minuses. First, it’s heavy and bulky, and the hip belt doesn’t allow the bag to stand upright even when the spine is contracted. The hip belt is also rather rigid, which is fine when you’re wearing it, but gets in the way when trying to store the bag in the footwell of a car or the overhead bin of an airplane. And sometimes the spine creaks a bit as you move. The fiddly carrying system also means that these aren’t bags you just toss over a shoulder when running out the door. None of those points are deal breakers, however. Although the price might be. Vertepac’s bags are not cheap. 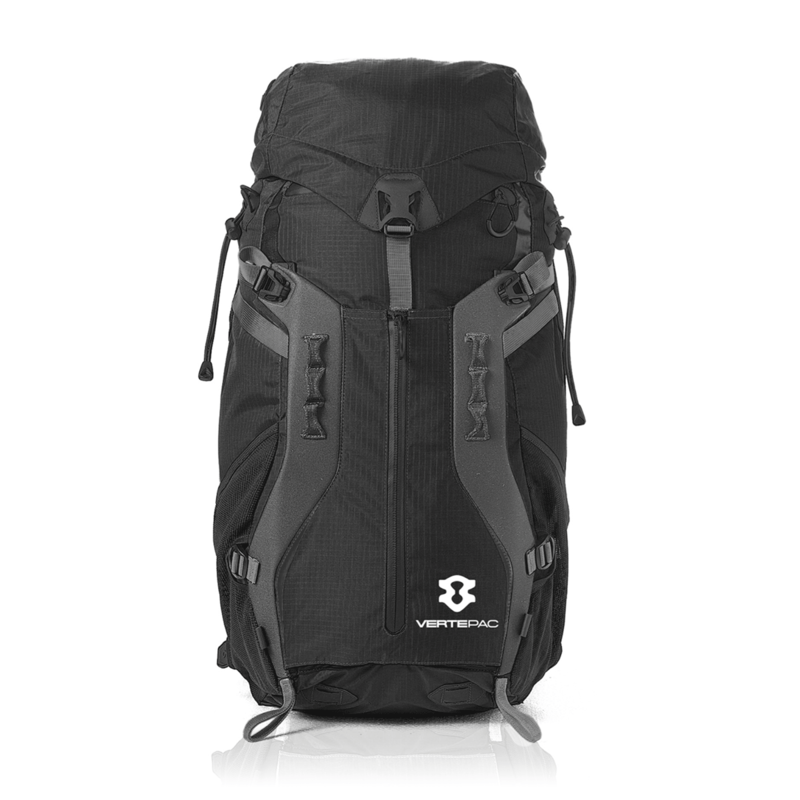 The big XTR.35 bag and carrying unit costs $359, while the smaller XTR.18 bundle costs $339. Or you can spend $439 for a single carrying unit and the two bags. Most of the expense here is for the carrying system, and the R&D required to develop it. Right now, the company only makes these two bags. But if things go as planned, Vertepac will be rolling out additional designs in the months ahead. Vertepac tells me that it’s actively developing a CAM.42 camera bag with a hard cover and a giant XTR.50 outdoor sports bag. And 2019 promises to be even bigger with five additional bags scheduled: a 100 percent waterproof AQ.25 roll top bag, a TAC.38 tactical bag, a TRV.42 travel bag, a URB.25 urban bag, and a QAP quick access add-on for your phone, wallet, and keys. The carrying unit (without a bag) is expected to be priced at $226, while the bags should cost between $103 and $289. On a long enough timeline, you can see how the Vertepac value proposition could pay off. But this fledgling company, that only started shipping its backpacks in July, has to succeed with the products it has now, not on the promise of what might come. Fortunately for Vertepac, the XTR.18 and XTR.35 are outstanding backpacks for outdoor adventures. If that’s you and you can afford it, then these bags could be transformative.